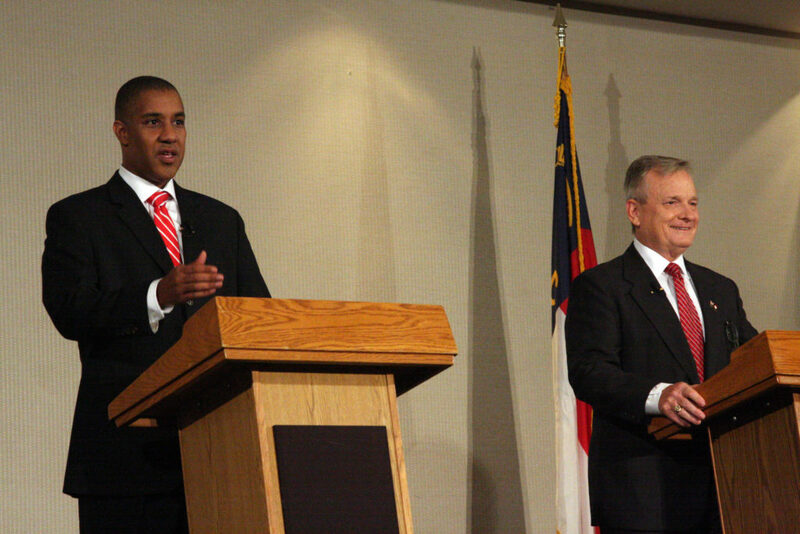 The debate, cosponsored by the North Carolina Institute of Political Leadership, Statesville Chamber, and others at the Statesville Civic Center, will be broadcast at 9 tonight on UNC-TV’s North Carolina Channel. It was the final of three events in the “Hometown Debates” series. “The state health care plan is bankrupt, and our state pension plan, one of the largest pools of money in the world, has tremendous headwinds that have to be attacked and solved,” Folwell said. The $30 billion unfunded liability in the health care plan, coupled with a retirement system that is not realizing its targeted 7.25 percent rate of investment return, would require 20 percent of the entire state budget over the next 15 years to fix, Folwell said. Displaying a bar graph illustrating a 1,000 percent increase in fees paid to Wall Street investment managers over the past 15 years, Folwell said he would pare those payouts “by $100 million at least,” as a starting point. He said “within the first three weeks of my [term]” he would determine where the state’s investments are, who’s managing the funds, how much they are paid, and how well they’re doing. “I am the only candidate up here who has not been to New York City to raise money for this treasurer’s race. When you raise money in New York City to become the next treasurer of North Carolina it somehow finds its way into these fees,” Folwell said. Clearly perturbed, Blue responded that Folwell has been in public office long enough to know that receiving money doesn’t influence decisions, and that during Folwell’s eight years in the General Assembly he accepted money from big insurance companies. “I’m not going to do that,” he said of yielding to campaign donors’ influence. “Let’s make sure we maintain our integrity, as well as maintain our precise language, sir,” Blue responded tartly. He said he, too, would call investment fund managers to Raleigh to review the plans, lower fees where possible, increase transparency, and possibly bring some functions back in-house. The status quo “is never acceptable,” said Blue, a bond attorney who has helped the Treasurer’s Office, universities and community colleges raise $700 million. He said the pension plan is funded at 95 to 96 percent, and experiencing “very adequate returns” in a dicey market the past few years. “That’s ironic,” Folwell said, noting he originated the idea of bringing all investment managers in for a review. “As a matter of fact my opponent is the candidate of the status quo,” endorsed by sitting Treasurer Janet Cowell. Regarding a proposed constitutional amendment reducing cap on the state personal income tax from 10 percent to 5.5 percent, which passed last session in the Senate, but was not taken up in the House, Blue said “that sort of legislation is frowned upon” by rating agencies because it reduces the certainty of being able to raise taxes to pay bills in times of economic downturn. He said a similar bill passed in Colorado hamstrung its ability to raise additional revenues to pay bills, and its bond rating was downgraded. Doing likewise in North Carolina could put its AAA bond rating at risk, increasing the interest rates it would pay to borrow money, and affecting how much it could borrow. Folwell countered that the Colorado bill was “far different” from the one proposed here, and that, in essence Blue is recommending the state should raise taxes during a recession. “That’s the exact wrong thing that we need to be doing,” he said. Reducing the unfunded pension and health care liabilities is far more important to protect the AAA bond rating, he said. “I’m the only one standing up on this podium who has a track record of doing anything like that,” Folwell said. He noted several times that the current administration and Republican-controlled General Assembly “inherited a lot of bad problems,” including a $2.7 billion federal unemployment insurance debt, which he was able to eliminate, and to build a $1 billion surplus in 31 months as assistant secretary in the Commerce Department’s Division of Employment Security. “He largely did that with the General Assembly’s help by cutting benefits,” Blue said. When the state doesn’t invest properly in its programs “we end up with toll roads” rather than tax-funded infrastructure, he said. North Carolina ran into financial trouble with the unemployment program during the 2008 recession because it didn’t make businesses pay enough into the system when the economy was healthy. “The individual who put the unemployment trust fund in that kind of deficit was Dan Blue, speaker of the House,” Folwell responded, naming his opponent’s father. Blue said the investment climate was souring in North Carolina, the state risks losing a half-billion dollars in federal funding, and the AAA bond rating could be in jeopardy because of House Bill 2, the state law requiring people to use bathrooms corresponding to their biological anatomy. He supports repeal of the bill. Both candidates said they would not sit on outside corporate boards as treasurer, as Cowell has chosen to do, agreeing that it would be a distraction from doing the work of the office. But Folwell said Blue initially said he would review such decisions on a case-by-case basis, and only changed his answer after Folwell made an issue of it. “I didn’t think it was going to be that big of an issue” because he was already considering putting out a press release clarifying his initial response to a newspaper, Blue said. At no time was he asked by the reporter about compensation for sitting on a board, he said. Folwell said rather than taking on more debt to fund public needs, “we need to focus on the debt that we have currently outstanding,” since the pension and health care systems will require much higher rates of investment. Blue said there needs to be a “broad conversation about infrastructure,” keeping mindful that there are also costs associated with doing nothing when interest rates are historically low.